Sheet metal forming is a metalworking of high relevance, because of the huge amount of parts that can be produced through this operation: from car bodies to home appliance, from furniture to parts for fine mechanics. 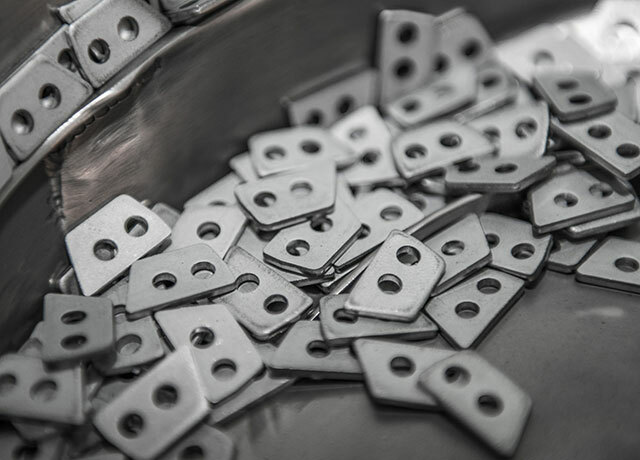 Stamping, also known as pressing, is usually executed on cold sheet metal and is especially suitable for high production quantities, thanks to its speed and to the low cost of the resulting products. Gima S.p.A. is specialized in stamping of metal hinges, parts for locks and home appliances, keys, accessories for musical instruments, springs, drawn parts, buckles and other parts made of stainless steel, brass, aluminium, harmonic steel etc. Shearing, also known as trimming or cutting, is usually the first operation in the production cycle of sheet metal parts; with shearing is possible to obtain semi-finished or finished products and it aims to generate plain sections. A stamping press executes the cutting, using die and punch. The sheet metal is placed between the two tools that pierce one in each other, stressing the workpiece until the material is fractured along a profile with the shape of the tools. A very important parameter for shearing operations is the clearance between die and punch, which must be set appropriately according to the material and its thickness. 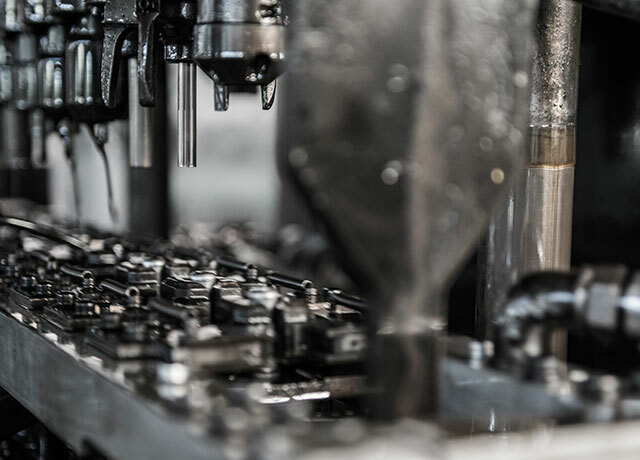 Moreover, to obtain a high quality part, one must choose the appropriate press and must design the die according to technical specifications that we describe in Die making & Engineering section. Stamping presses can be divided into hydraulically driven presses and mechanically driven presses. The formers are driven by a hydraulic fluid that operates inside one or more pistons. Hydraulic presses are especially suitable for deep drawing operations, at the expense of a low speed. There are two kind of mechanical presses: eccentric and toggle presses. Thanks to their higher speed, they are commonly used for shearing or bending and, especially the toggle press, for coining operations. An electrical motor put a flywheel in motion, which provides the kinetic energy to drive the eccentric or the toggle mechanism. Gima S.p.A., supported by experience in stamping operations since the birth of the company, with a continuous investment in new equipment, can praise an enviable machine fleet. The factory features 25 mechanical presses with a strength up to 315 tons and working tables over two meters. The presses are set in a 5500 square meters facility, where a specialized workshop for dies maintenance and construction is also located. In this way, Gima S.p.A. can guarantee a quick and agile production, reducing downtime due to breakage or wear, and offering the customer a high quality product with a low lead-time. Drawing is a metalworking process, which allows obtaining a hollow body, box-shaped, cylindrical or cup-shaped through a deep plastic deformation. With deep drawing is possible to produce pieces such as cans, pots and other containers produced in one part, starting from a sheet metal strip. The workpiece gets hold with the right pressure between the die and a blank holder. The blank holder prevent wrinkles formation, controlling the material flow and speed while the punch pushes the workpiece against the die. With progressive drawing operations is possible to increment the limiting drawing ratio D/d, where D is the blank diameter and d is the final diameter. Gima S.p.A. stamping department provides deep drawing through transfer dies, producing from since more than 30 years deep drawn parts with a length of 4.5 times the diameter. 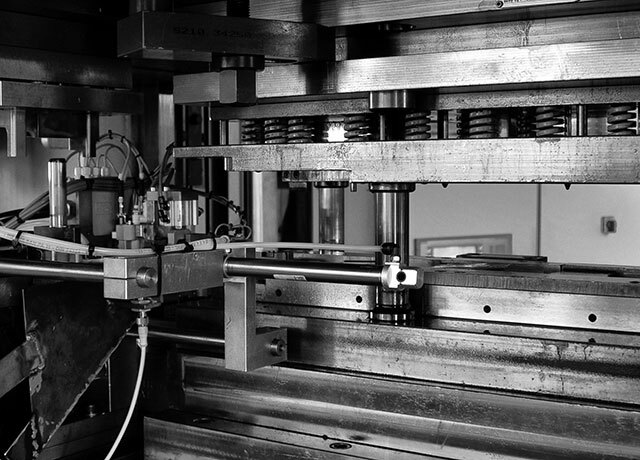 Another common process in the stamping department is the bending. Bending is often executed in progressive dies in combination with other operations, like cutting or coining, to define more general and complex cold forming procedures. Bending allows the creation of folds on a flat sheet metal surface, in order to obtain more complex and 3-dimensional geometries. Coining is a very precise stamping process, in which a die and a punch squeeze or compress the workpiece, applying a high stress on it. This process allows the material to flow in the gaps, in order to obtain the desired geometry. Coining is used to produce coins, medals and other parts that need a relief or a written pattern on the surface. The stamping department also has available wire-bending machines for the production of springs used in the joint articulation of show lasts. This kind of springs are usually made of tempered harmonic steel.